In last week's post, we were talking about Morning Meeting and the FINISH THAT portion of this wonderful teaching tool in which we talked about poems, songs, and patterns. If you missed last week's post, be sure and check it out here. 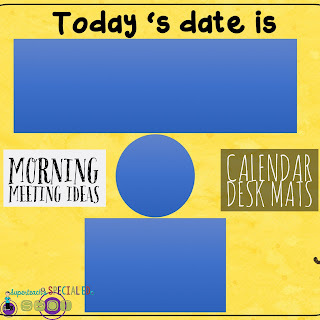 Today I would like to share about the calendar section of Morning Meetings. This can be one of the most fun sections to implement because there are so many different ways to do it. Today we will focus on just a couple of them and ways to differentiate them and some ideas for keeping everyone engaged no matter what their levels. A very common way to conduct calendar time is to have a calendar area on the wall and have different students take turns moving or changing the items on the calendar wall each day. Parts of this section usually includes the date, days of the week such as yesterday, today and tomorrow. weather, counting, shapes, appropriate apparel. and patterns. The problem I found with this method for some of my classes was that it provided time for one or perhaps two students to interact with the calendar at a time, leaving the others sitting and waiting. For many students in self-contained classrooms, there is a wide range of skill levels. Using one calendar and one skill focus for the activity for the entire group of students is not the best way many times for them to be working on appropriate skills. Another factor I consider is that kids with special needs, often need more activities that keep them motivated. It can be challenging to keep them still and attending while one student at a time goes to the calendar wall to manipulate pieces. Don't get me wrong if you have a class that can handle this type of calendar, that is great! 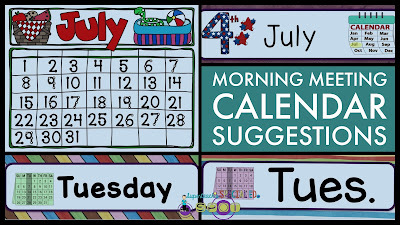 I have done calendar walls and bulletins boards many times and adore them, but today I want to address calendar time in a class with kids that may have a variety of disabilities with many different skill levels. How do we keep each child in this type of classroom on task for calendar and engaged on a level where they can function successfully. 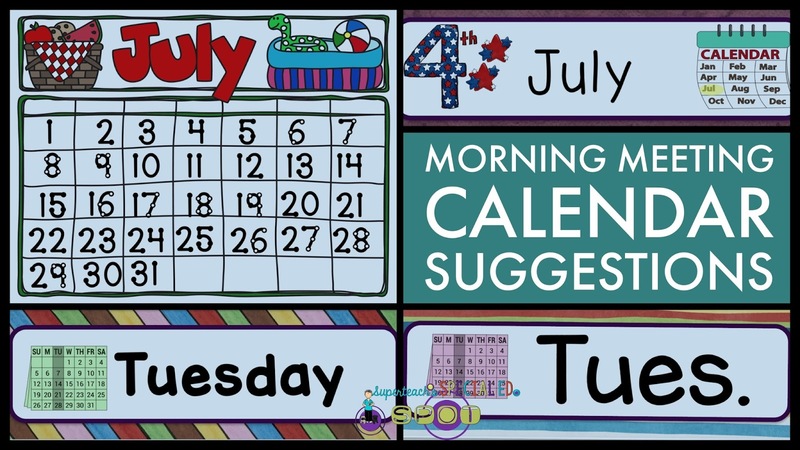 Let's take a look at some ideas for Calendar Time in morning meetings and some ways to differentiate while keeping all students engaged. I took the ideas from the wall calendar and personalized them into a mini-calendar for each child. Instead of putting the calendar section on a wall or bulletin board, try one of these ideas. Here is an example of a wipe off calendar where the student only has to circle the date it is. This could be varied with calendars the student needs to write in the month and the date or circle the month and the date. 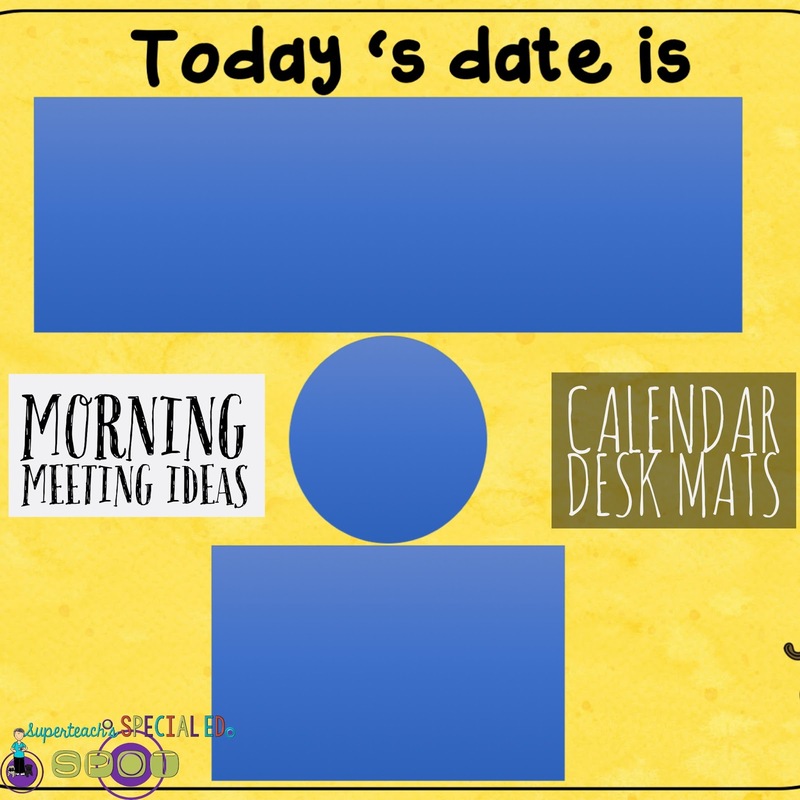 Another way to do it is to put each component you want a student to work on its own page and combine them into a morning meeting notebook for each child. The advantage I found with this method was it gives me the ability to select the skill pages I wanted in each child's notebook and the skills can be modified up or down as needed for the child's skill level. What I try to do is to have several skill levels available for the notebooks. For instance, for Today's Date, I might incorporate 3 different levels; 3 ways of responding. One might be using words to designate the date where the student must read the words and select the correct cards for the month, the numeral date and the year. Another option I use is a calendar for the specific month and all the student needs to do is circle the correct day or point to it. If the child uses TouchMath then I incorporate the points on the numbers to make it easier for the student to read and use the numbers. Another alternative could use word bank of months of the year, dates and year. The students then would write in the information required. Here is an example of a desk mat that has a rectangle place holder for the month of the year, a circle placeholder for the date and a smaller placeholder for the year. Use one desk mat like this and then another blank one opposite to this with the date pieces the student can pick from. The teacher can control the number date pieces the student has, whether the pieces have words on them or pictures or a combination of both. It can also have pictorial representations of sign language if you need that. These are just a few springboard ideas for ways to adapt calendar time to meet the needs of your students. Join me next time for more ideas on Morning Meeting and how to introduce it to your class and get it up and running. I would like to personally congratulate you as your blog Superteach's Special Ed Spo has been selected by our panelist as one of the Top 100 Special Education Blogs on the web. For me morning meetings are the most productive but the most complicated ones. Of course all people are more energetic and productive in the morning, but for me it's very hard to get up so early in the morning. Many reviews on Essaytigers.com say that people are divided into those who sleep long hours and wake up with great efforts, and those who sleep few hours and wake up very early vert easy. I think I belong to the first group.